Found a home in a bed room in Somerville, MA. 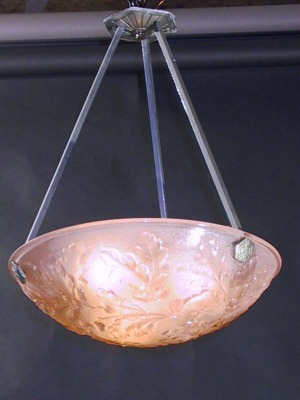 Circa 1930, this zinfandel color Art Deco Inverted Dome has leaf and berry details throughout. The Art Deco detailed nickel plated holder is a nice contrast color for this dome. 21" length x 16" diameter.